One of the most precious not to mention the most expensive essential oils, neroli is an intoxicating blend of floral and citrus aromas with a vast range of therapeutic benefits for you to enjoy. Neroli essential oil is a product of the bitter orange tree known scientifically as Citrus Aurantium. No less than three essential oils are derived from this tree. Petitgrain is extracted from its leaves, bitter orange oil from its fruit and finally neroli oil is steam distilled from its small white blossoms. In fact, it takes in the range of 1000 pounds of its hand-picked flowers to make just a pound of essential oil which partly explains its price tag. To ensure that the highest possible quality neroli oil is produced, the blossoms are handpicked carefully ensuring they are not damaged or bruised. While the bitter orange tree is an original native of Africa and Asia, it is also cultivated these days in Mediterranean Europe as well as California and Florida. In times gone by, neroli oil was used to fight the plague, treat fevers and banish nerves. In ancient Egypt, it was used by ladies in the upper echelons of society for emotional and spiritual well-being. These days, it is commonly used in the perfume industry because of its alluring fragrance as well as its many uses in aromatherapy. Neroli essential oil has such a wide range of health benefits owing to its range of medicinal properties including antiseptic, anti-inflammatory, antibacterial and antispasmodic abilities. It is also a natural antidepressant with carminative and sedative properties. When it comes to muscular and joint pain, neroli essential oil provides an effective natural answer. Neroli oil has excellent anti-inflammatory properties that can help reduce inflammation and ease muscular pain. To treat your aching muscles and joints, you can dilute your neroli oil in a suitable carrier oil and massage it into the affected areas of your body or add several drops to your bathwater and let its healing properties sink in. As well as its ability to ease muscular pain, neroli essential oil can be a very effective remedy for headaches and migraines as many people can attest to. Instead of turning to commercial pain killers, try massaging a few drops of neroli oil into your temples whenever you suffer a headache. Another effective option is to add a couple of drops of your neroli oil to a cold or hot compress and apply it to your head. This is especially effective when it comes to headaches caused by stress and tension. If you are one of the many people who are affected by stress, anxiety or panic attacks then neroli oil may provide a welcome alternative to the often prescribed anti-anxiety medications. These prescription drugs can certainly be helpful but they are also known to cause a number of adverse side effects not to mention the very real risk of addiction. Fortunately, there are numerous essential oils which are proving very effective in alleviating the symptoms of anxiety and stress and neroli is one of them. If you are prone to anxiety attacks or are just feeling generally stressed out, try inhaling neroli essential oil directly or diffusing it through your home or workplace and you might find that you are calmer and more centered emotionally. It seems incredible that simply inhaling a natural substance could have a positive impact on a person’s blood pressure levels but that is exactly what research has demonstrated. High blood pressure is a major cause of many illnesses especially related to the heart and is there anything more important than a healthy heart? A study published in 2012 set out to explore the effects on blood pressure of inhaling a blend of essential oils including neroli, ylang-ylang, marjoram and lavender. 83 patients with high blood pressure were involved in the experiment with the subjects divided into three groups. The first group inhaled the essential oil blend at regular intervals during the 24 hour experiment with a placebo group inhaling artificial fragrances and a control group receiving no treatment at all. The researchers concluded that treatment with this blend of essential oils could have a very significant impact on both blood pressure and stress levels which let’s face it, is great news. The effects of the menopause can be extremely problematic for countless women around the world many of whom will opt for hormone replacement therapy. There are however some positive indications coming from research into the effects of neroli essential oil on menopausal women. We have already mentioned a piece of research that showed neroli oil could reduce stress levels in post-menopausal women but that same research also found that neroli could benefit women in many other ways. The Korean study which was published in 2014 recruited 63 post-menopausal women and investigated the effects of neroli oil inhalation on menopausal symptoms, estrogen and stress levels. The subjects were divided into three groups and either inhaled neroli oil in different concentrations or almond oil for five minutes two times a day over the course of five days. Like so many essential oils, neroli has excellent antimicrobial properties that can help treat minor wounds and burns and prevent bacteria from taking hold. If you have a small scratch or wound that needs attention, then you can apply neroli oil to the affected area to improve the speed of healing and to ensure bacteria does not take a hold. Neroli essential oil might be expensive but it is a popular addition to the skin treatment routines of many people. Because of its excellent antimicrobial ability, it may help treat conditions like acne and eczema naturally. It can also help to regenerate skin cells and improve the skin’s elasticity which should help you look younger and fresher. Its antioxidant properties also make it useful in reversing cellular damage that is so obvious on the skin and may even help reverse some of those telltale signs that we are getting older like blemishes, age spots and wrinkles. Neroli oil is considered to be an excellent option for all skin types so if you can afford it, consider adding it to your skin care regime. Before applying neroli essential oil to your skin, wash your face with clean, warm water then apply the oil with a cotton swab or ball. Make sure that you do not apply the oil undiluted. Mix it first with a suitable carrier oil like argan oil or jojoba. As well as being able to tackle common skin conditions, neroli oil may be extremely useful to get rid of unwanted scars and stretch marks. It can rejuvenate the skin at a deep cellular level and although it may take some time, if you persist with using it then your scars and stretch marks may dissipate over time. Make sure that you dilute your neroli essential oil with a suitable carrier oil like virgin coconut oil which also may be effective on stretch marks. Obviously seizures are serious medical conditions that require proper medical care and advice but it is interesting that neroli essential oil has demonstrated anticonvulsant anilities which may give it some future potential in the treatment of seizures. Neroli oil may help settle the stomach and improve digestion. Experts suggest that simply inhaling the oil or applying a little diluted oil to your abdomen can reduce the symptoms of many common digestive issues including indigestion and cramps. It is also possible that inhaling neroli essential oil can help improve your appetite which is very useful when recovering from illness. 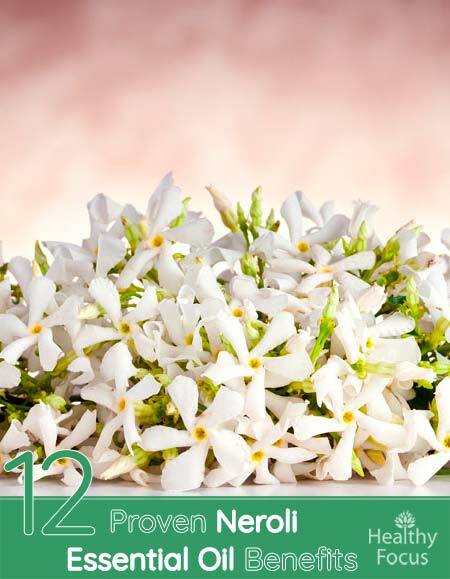 Neroli oil has a delightful fragrance that can help you to smell fresh throughout the day. It may seem like quite a waste of a very good quality oil but just a few drops applied under the arms may help prevent body odor. Not only is neroli incredibly fragrant but its antimicrobial qualities help kill the bacteria which causes many people to suffer from body odor. Neroli essential oil also has excellent antimicrobial and antiseptic properties because of the presence of geraniol, camphol and linalool, This make neroli oil an outstanding natural remedy for mites and lice. It can also help destroy bacteria and fungus that thrives on your scalp. Not only that, but neroli oil can help get rid of excess oil and the dead skin cells that gather on the scalp during the day. Because of its anti-fungal abilities, neroli oil may help eradicate the tell tale signs of dandruff as well as treating the condition itself. By adding a little neroli essential oil to your regular hair routine, you can protect against dandruff and look forward to stronger, better looking hair. It also smells great. Neroli essential oil is great when used alone but bearing in mind how expensive it is, you might want to blend it with another essential oil. Neroli blends very well with numerous other essential oils but goes especially well with the other citrus oils. It also blends perfectly with ylang-ylang, lavender, rosemary, geranium and sandalwood. Like other essential oils, how you use your neroli oil will depend on the condition you are trying to treat. There are many potential uses but some of the most common include the following. Inhalation: either direct inhalation or via a diffuser machine to deal with stress and anxiety or high blood pressure. Massage: when combined with a carrier oil, neroli is an excellent remedy for muscle and joint pain as well as being an excellent headache relief. Topical application: to treat skin conditions like acne or eczema or to get rid of scars and stretch marks, apply your neroli oil to the affected area with a damp cotton ball or for larger areas, dilute it in a skin friendly carrier oil before you apply it. Compress: ad a few drops of neroli oil to a cold or hot compress and apply it to your head to get rid of migraines and headaches. For your Hair : Add a few drops of neroli oil to your regular shampoo or conditioner. What is Neroli essential oil good for? Neroili essential oil may be expensive nut it is a very effective and extremely diverse essential oil that can treat a wide range of conditions. It is used in aromatherapy to calm the mind and treat stress and anxiety. It is also used to treat headaches and arthritis, relieve pain, improve digestion and reduce blood pressure. Neroli essential oil is also great for the skin and hair. It can help diminish the appearance of scars and stretch marks while its antimicrobial and antiseptic properties also make it suitable for acne and common skin conditions like eczema. What mixes well with neroli essential oil? Like most essential oils, neroli is even more effective when combined with another oil or two. Neroli essential oil blends especially well with floral oils like chamomile, jasmine, geranium, clary sage, lavender, ylang-ylang and juniper. It also blends well with other citrus oils such as lemon, orange, mandarin and grapefruit oil. Is neroli oil good for your skin? Yes it is. Neroli essential oil has excellent antibacterial, antiseptic and anti-inflammatory properties making it a good choice for acne and inflammatory skin complaints like eczema, psoriasis and rosacea. You can also use it on wrinkles, blemishes, scars and even stretch marks. Be sure to dilute your oil with a carrier oil before applying it to your skin. Neroli essential oil is considered to be a safe and non-toxic oil but as usual, you need to exercise a certain degree of caution before using it. You should not ingest neroli essential oil. You should always dilute it well with a carrier oil before applying it to your skin. Even once diluted, it is best to perform a patch test on a discrete area of your skin to ensure that you are not allergic before applying it in larger doses. There is not sufficient evidence to say with certainty that neroli oil is absolutely safe for pregnant women, breast feeding mothers or very young children.